Intivity Center is meeting place, museum, educational stop and first stop on factory tour. Picking up a new machine at the end of the assembly line is the dream of many "gear heads" whether they be auto enthusiasts or farmers waiting on their newest farm tractor or harvester. There's just something about starting that blood and iron relationship where it all began -- rather than in a showroom or on a dealer lot. 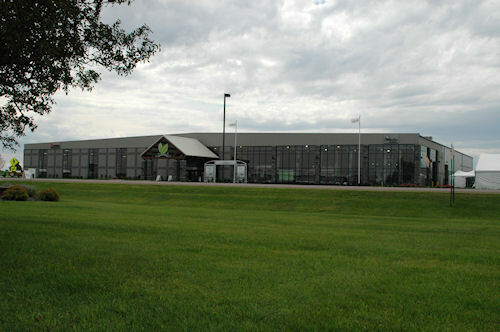 Agco's newly-expanded factory in Jackson, Minn., caters directly to that desire, and includes a sparkling new educational center and museum dedicated to the amalgamation that is Agco and the engineering feats that led to the leadership of the companies that now make up the global farm machinery maker. The Intivity Center is filled with new Agco products along with interactive exhibits chronicling the history and planned future of the company and its products. Educational exhibits, a visitors' gift shop and an overlook view of the new assembly line are highlights of the center. Named for Inspiration and Productivity, the Intivity Center is a 17,000-square-foot visitor center that offers an interactive look at Agco as a company and the history of the companies that are in its bloodstream. The history of tracked farm tractors, now flagshipped by the Challenger brand, along with the first-to-the-latest diesel engines that power Agco equipment highlight the look back in the center. Meanwhile, visitors can see cutaways and graphic illustrations explaining the operation of Agco's powershift transmissions and hydraulic systems, and even learn the origins of the "Ferguson" hydraulic system that spawned light-duty three-point hitch systems -- and caused a lasting feud between Ferguson and Henry Ford. Looking forward, the Intivity Center features animations of future products and systems that probably will be common-place later this century. Agco's new factory building in Jackson, Minn., features an all-new assembly line, and a state of the art visitors' center -- the Intivity Center. The facility now produces high-horsepower tractors for the North American market for Massey-Ferguson and Challenger. The center is open to the public, but factory tours must be scheduled. Customers coming to the factory to be introduced to their new equipment automatically get the tour of the Intivity Center as part of their visit, before touring the new single-line assembly center across the wall from the center. At the end of that line, they can get acquainted with their new machine -- most likely one of Massey Ferguson's or Challenger's new high-horsepower tractors which are now being built in Jackson instead of just outside Paris, France. The center is open Monday through Friday, 9 a.m. to 4 p.m., except holidays. For more details, or for reservations for a tour, visit INTIVITY CENTER.